Buffed?! Yeah OK.. you got the patch notes? perhaps, to help me know what I'm talking about.. the part where it says it got buffed? Last I can find is from last September (opt-in).. I must say, them few meters they added really broke the game balance. Uni-Sol -- yeah, the damage dropoff change was the biggie. I've said in the past that the shotgun can be pretty crazy now. It really strongly depends on how dead-on your aim is; a little bit off and you'll only be hitting for 10-20 damage at 20m instead of 60-70. 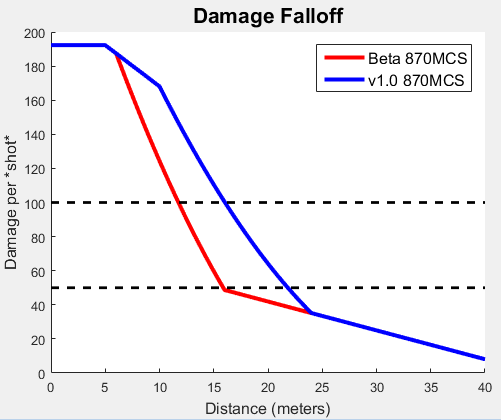 Damage drops with range. Spread increases too, so the number of pellets expected to hit also goes down with range. Combine the effects and you get something roughly like this. This is rough damage *per shot*, not per pellet. Black dotted lines show rough limits for one-shot and two-shot kills under ideal conditions. The numbers were estimated by shooting at idle pawns at various ranges and seeing where they went from 1-shot to 2-shot to 3-shot kills. What was previously 2-shot territory in beta is now 1-shot territory. Much of what was previously 3-shot territory is now 2-shot. Oh I understand fully its lethality and thanks for the explanation, however even taking on board all that.. the weapon is still owing to a large chunk of luck in game, in 99% of situations your not 16m away from a person standing still and neither is the enemy, now, if your watching a spot that far away with a shotgun, your not doing it right, especially when your oppo is packing something that can undo your idiocy in a second. I'm sorry but I don't think anyone can honestly say it's near consistent enough.. man the thing is reliant on too many factors such as enemy HP, spread pattern, player position, how many pellets actually hit and where.. to even warrant a call of OP.. and then to go one further and be branded the best gun in the game.. come on now, this is the Shotgun were talking about here. I definitely wouldn't say it's the 'best' weapon in the game right now, that honor probably belongs to the DMR M16. I do think it's underrated by many players. The numbers are less to say "It will 1-shot for engagements at this range" and more show how large the change is compared to beta. This change happened back in beta, but the spread pattern actually is a pretty even spread. They added a handful of preset patterns for its spread so there's actually way more consistency in the pattern than players would probably expect. Personally, I think usage trends should dictate balance changes. If one side always wins on a map, change the map. If a weapon isn't getting used (and the shotgun really wasn't getting used very much in beta), buff it. I see shotguns more often than in the past, but it's still nowhere near as common as anything else. It's commonality is one of those things.. for me and my experience using it over the time I have and also from what I've heard from others on various servers is that it just gets too much hate, there are not many players who like using it (in fear of being called a scrub or other popular names for bad players) and for sure nobody likes getting killed by it. Both scenarios contribute greatly I think to it's popularity. I can't talk for anyone else and I'm never one to blow my own trumpet.. but for example I can sometimes feel guilty scoring a lucky kill with it (even if it was part intention) and so change to M4 once the cries of either foul play come or the shouts of "The shotgun is OP". I can only assume others who use it do the same. Another game had a bug where one of the shotguns fired 5.56mm rounds instead of buckshot -- like, instead of 11 pellets, it fired 11 bullets. It got *massively* abused and was unbelievably OP. Players taking advantage of it got called all sorts of names and nearly any server with an admin online would kick or ban for abusing it. Point being -- I think, overall, players go with what they think works great in spite of what others may think of the choice. That's just part of why I trust usage trends for gauging strength. "Wisdom of crowds" and all that. The shotgun in AAPG is intended to fill a more niche CQB role, so the expectations for its use are probably naturally lower. I don't think it really needs a change until it's commonplace. I think it's more effective than you may give it credit for, but I think we're on the same page on whether it needs to be changed. I want to see Colts use the shotgun exclusively against his pro comp buddies. Using it on mortal foes like us is not a fair fight anyway. The shotgun for me is not as consistent as the M4, hence I won't bet my life on it. One who averages a 1.32 kill death ratio is clearly unable to judge weapon opness. I didn't see you running around headshotting players across the map when the pistol was OP in open beta did I? Lel. I was running 20-25 FPS in beta and some of full release, it wasn't that long ago I started running 60. My K/D and accuracy have both been rising nicely since then. If you doubt me so much, talk to Panther. Not to mention, Colts, you're OP no matter what weapon you use. This is a thread about the update. If you want to have other discussions please make new topics. Point taken, since this update didn't involve the shotgun. Sorry, FunPolice. I will say I like the what you did to the m24 and m14 for sway. Is the server in question running via the Host A Server App or is it a rented slot server from a GSP? not running UMMs but it surely is map related. It's an NFO virtual server. I don't think its UMM related can test that out easily though and see. Is the server password protected? if so, it is a known issue.